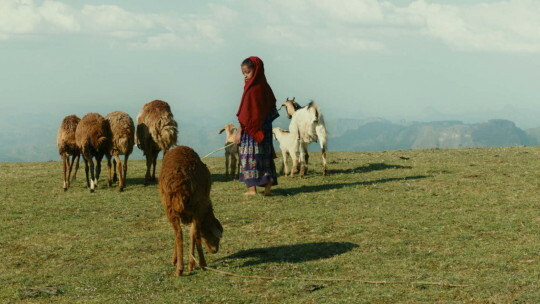 Ethiopia's submission for the Oscars caused a big stir when it was selected for Cannes and garnered some glowing reviews. The film is opening the New York Jewish Film Festival. Wednesday night. This coming of age story tells the story of Ephraim a young man left by his father with some distant relatives. He needs to go to the city to look for work and can not bring the boy. Since the boy's mother recently died there is no one to take care of him. Ephraim brings along his mother's sheep, who is his best friend, but things become complicated when the lamb is slated to become dinner for the holidays. If you want to start off your 2016 seeing some incredible images then run and see LAMB as fast as possible because this film will bowl you over. It’s so breathtaking that odds are you’ll be on the phone booking your next vacation to the films locations. I can’t stress how good the film looks, and in a small scale gem like this the look of the film carries as much weight as the cast and the script in making the film work. The film’s story is simple but not simplistic. I like that we more or less dropped in the story and allowed to watch it all unfold. We are not given anything that we don’t need. For example we don’t know how Ephraim’s mother died. There is no reason for us to know that so it never comes up. There are many moments in the film like that and we are better for it. I know that may be an odd thing to discuss but do you don’t realize how many films today explain too much. This film doesn’t- actually the one problem with LAMB is that in the last third or so the film becomes complicated as Ephraim has to sell food in the market to care for the care of his lamb and he’s bullied. It’s a turn that seems a little too much considering everything else in the film. There isn’t anything wrong with it, It’s just an added layer that isn’t really needed. As an exploration of where one belongs and what are people's roles in society (Ephraim likes to cook, something considered women's work) this film gives us a great deal to think about. I'd be very curious how the film was received in Ethiopia where the society is in the middle of changing. I like LAMB a great deal. It’s a lovely slice of life and worth a look. Nightcap 1/3/15 Unseen Films were art thou bound?